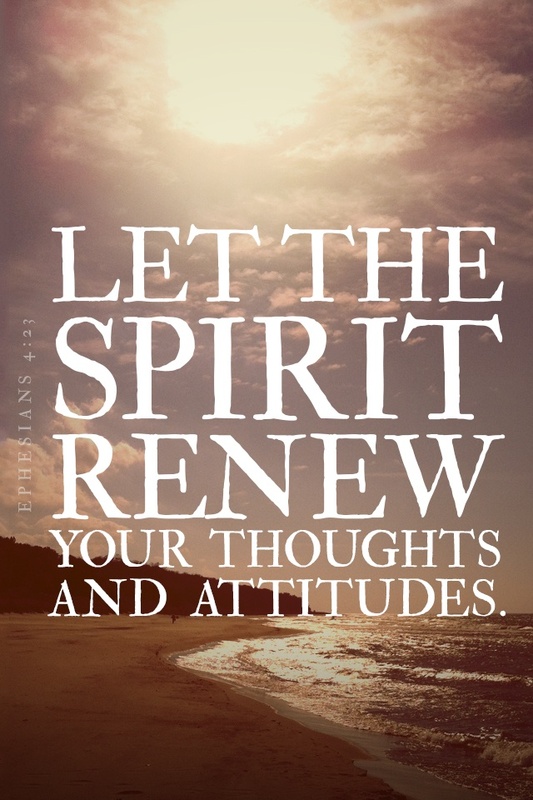 It’s Time to Renew Your Spirit! From time to time we all may stray from God. It’s normal. He knows we will, but He continually calls us back to Him. It’s always an open invitation. We just need to respond by reaching back out to God. He is always there with us. That soft voice of a whisper you hear at times in your head, that is God leading you back to Him. All we need to do is take time to talk with God and become closer. It’s no great effort on our part – we just need to give in and open our hearts to His loving presence. He wants us to experience the depth of His love for us. God never said that life would easy. He never said we wouldn’t experience pain, but He did say He would never foresake us. He may not provide immediate relief when we pray for Him to do so, but know that He is setting in motion the conditions we need. It just won’t happen on our timetable. God’s plan is the best plan. Remember, too, that God gifts everyone something different. He may have blessed one person with abundance and they seem to be living a life of ease. Yet He may have blessed another person with fragility, and through that they too will learn their lessons and be blessed in many ways through their struggles, and yet still live a life of abundance! No matter what we are blessed with, know that we are God’s children and He wants the best for each of us. When we seek God and make the time to grow closer to Him, He comes closer to us. He will renew our hearts. He will make us strong. He will get us through the toughest of situations. He will give us lasting life. You see when we become closer to God, our spirit does renew; because His Spirit is in us. It is that soft voice we hear that moves us to follow His plan. We just need to be open to receiving His Word and knowing it is His Will that we are acting on. Like I posted the other day, brush off that devil on your shoulder and let the good guy win! With God we can do so much more! With God, we will live an abundant life! I can’t tell you how many times I have strayed away from my dedicated time with God because of my own desire to spend my time more productively doing the things I feel I must do. Yet, every time I come back to that quiet place talking with God and being present with Him, I am always amazed. It’s as if He knows, and He does, exactly where I leave off and when I will pick back up again! This morning was one of those days. It is my desire to start my day with God because I know that is the best way to stay intuned with Him, His desires, and His Will for my life. Then, it is the evil one who tempts me into wondering what’s happening on Facebook or who responded to my messages, etc. Once I give in to the distraction, it just spirals into my day and God is left waiting for me to return. I always return in the evening in prayer, but had I started my day with Him instead, the result would have been so much greater! You see, as we grow in our desire to please Him above all else, we gain strength to resist these distractions. It is a daily battle, but if we stick with God, we can’t go wrong – for God is the way! For me, it’s as if He answers my prayers almost immediately at times. I always give Him the praise and express my gratitude towards Him because without Him it would not be possible! I give Him thanks first, and then I let Him know what it is I need. I always ask Him to bring the right people into my life to help me do His Will! If you are lucky enough to know in your heart what His Will is for you, then you are truly blessed. He has a plan for all of us and He gave each of us a Gift that we are capable of blessing so many with. For me, every since I was a young child, He placed a dream in my heart to be an Author. I never thought that would happen in a million years, but He had a plan. You’ve heard though that it will happen in His Timing, that is so true. I had tried earlier to attempt writing a book, but nothing ever happened. His plan for me was to write spiritual inspirational stories and that plan took time. It took Him putting me into situations where I could learn what I needed to learn before I was actually ready. He placed certain people in my path that would help me. He led me in the right direction and reguided my steps when I took the wrong path. Nothing will stop His Plan, though it may take you much longer to get there when you are not listening and following His lead. Now that I know this, when I pray, He answers me. I, though, have to be open and patient to recognizing His words, His plan, and His timing. I do this in knowing and believing in Him and Him alone! For His Spirit is always with me, and He can do amazing things! He has blessed me in so many ways and I know that the best is yet to come! He gave me a second chance at life. He allowed me to heal inside and out after a heart attack last year. He has blessed me with my second book, “Break Down Your Walls: Be the Person God Created…Be a Better YOU!” available now on Amazon. Where I share with you everything I learned and wish I had known before my heart attack. I learned how to deal with my stress, which is what caused my heart attack. Now, through my writing, I am able to help so many others who are struggling as well. Now, He is working for me to put me in a situation where I can begin to grow my following in a manner that will allow me to dedicate more and more of my time on His Will. I have found that His Will for me is inspiring others to become a better person, physically, emotionally, and spiritually. The current path He is leading me on is the natural path of wellness in living an abundant life of overall wellness by spreading the love of essential oils. Essential Oils was God’s Gift to us from day one! They date back to before Genesis in the Bible and are mentioned throughout the Bible as being the cure to many ailments. I have found that Young Living Essential Oils is the only company that I would trust when it comes to 100% Thereapeutic Grade Oils because they are the only company with the Seed-to-Seal promise guaranteeing their authenticity through rigorous testing methods and processes to ensure nothing but the absolute best quality. The oils and products that Young Living offers support every system in our body and aid in supporting our overall wellness, emotions, balancing our spiritually through meditation and aromatherapy. There are three ways you can use the essential oils: topically, aromatically, and ingesting by using the vitality oils that you can put in your water, use in cooking, or take internally with a vegetable capsule as a dietary supplement. If you are interested in following me on my spiritual journey, receive my messages, purchase my books, or learn about essential oils, here is my contact information – I would love to connect with you! Last year after my heart attack, which was all due to stress, I had even more stress and anxiety as a result of almost losing my life. I remember screaming in my head, “God I am not ready to Die!” He gave me that second chance and I thank Him every day for that! Since then, I have prayed for Him to give me a way to help to supplement our health and our income so eventually we could relieve some of our stress. If you’ve been following me, you know Mom and I have been writing for years and that has been our ultimate dream and goal in life. During my recovery period after that heart-attack is when I was writing my second book, “Break Down Your Walls: Be the Person God Created … Be a Better You!” While I was writing that book, is when I was praying and it felt like I was praying the entire time I was writing. It also seemed that He was giving me the words to write, as He usually does. It was two weeks later when Young Living came into my life. At first, I had no intention of selling Young Living. After all, I just had a heart attack, was preparing to go back to the same stressful job, and certainly couldn’t take on another project at that time. However, as soon as it dawned on me that Young Living could be the answer to my prayers, my thought process immediately changed, as did my life! I knew without a doubt that this was God’s answer for me I have given it my all ever since. Young Living has changed me and my ways in so many different aspects. I couldn’t be happier. I thoroughly enjoy sharing and helping other people realize the benefits of essential oils and how they too can change their lives physically, emotionally, and spiritually! I do this through my inspirational writing as I have been doing for years, and now I also am able to share the love of oils and how they can help support our emotions, stress levels, health, and overall wellness! If you would like to learn more about Young Living and how you too could find an affordable way to ditch the chemicals in your life and switch to a more natural way of living through plant-based products, I would love for you to join me Thursday, August 10th at 8pm EST LIVE on Facebook. Please connect with me through Facebook https://www.facebook.com/sharon.daileyshabinaw and let me know if you’re interested and I’ll be sure to add you to the invite! It can change your life as well! You won’t be sorry! After all, essential oils were God’s gift to us and date back to Genesis and mentioned in the Bible many, many times! This is something I have learned over the years, and it truly does seem that the more you seek, the more you will find. The more you reach out to God for support, the more support you will receive. You see, all we have to do is turn to God, give Him our worries, our problems, our desires, and in return He blesses us beyond our wildest dreams. The thing though is, that once we give it to God, we have to have faith that He Will will be done! God has a plan and we cannot change that plan, even if it is not what we wanted. What we will find though, if we give it time, is that His plan is a better plan for all involved. To take it a step further, we have to also realize that it is not always just about us and our desires, but the desires and the needs for everyone involved. Sometimes, it doesn’t make sense to us, but we have to trust that His way, is the best way! One day it will make sense, and until that day comes, leave it to God, put your trust in Him, and Faith in the unknown. When we start recognizing God’s hand and show gratitude, the more we will recognize His Will in everything! Everyone likes to hear that they are doing a great job at work or whatever it is they are doing, right? At your workplace, whether someone is doing great or someone is doing bad, word of mouth travels, right? I’ve found the answer to this is definitely a YES! Obviously, the good word spreading could lead to a raise, or a promotion and a lifetime of appreciation and a career to be proud of! In today’s world, there are so many authors out there that we have to compete with and technology has made it even harder to compete. Anyone can self-publish a book these days pretty inexpensively and get it posted to Amazon for distribution. The thing is that if you aren’t getting the hits, likes, and purchases to your book, that the algorithms don’t move your book up for easier reviewing. The more hits and reviews you receive though, the higher up your book moves in the ranking. The next time you read a book you enjoy, give this some thought and help a starving author out by giving them a quick review! Who knows maybe that one nice gesture starts a chain reaction that could have them ranking up to a #1 Best Seller! I appreciate your support – It means the world to me! Everyone is struggling with something. For some it might seem like an easy task, but to others it may be the one thing that stops them in their tracks. We are all different, and we all have our breaking point. You see God didn’t say life was going to be easy and that we wouldn’t face challenges. It is those challenges though that make us stronger! Especially, when being strong is the only choice you have. Look at the picture and just imagine….what if that next little duckling nudged the first duckling, wouldn’t it take some pressure off that first duckling? Of course it would! Now, look back at what you’ve been struggling with. Try to imagine if someone had shared their story with you about how they overcame that same struggle, wouldn’t their trymph have helped you in taking your next step? Sometimes, the struggle is real and we don’t want other people to know we are struggling, right? We think we are invisible. We think we can do anything, but what we are doing wrong is trying to do it ourselves! When I started sharing my story and my mom’s story, it amazed me how many people were dealing with the same struggles or knew someone that was. It can be such an invigorating moment when you learn to be vulnerable and that vulnerability was the source of breaking that affliction for someone else. Someone you just met, and it was your vulnerability that allowed them to be vulnerable as well. When that happens, it feels like you could talk for hours with that person and when you leave it is as though you’ve known them all your life! The impact you left on that person can last a lifetime, even though you may never speak to that person again, and that is an amazing feeling! By sharing our stories, someone out there will know they are not alone in their struggles. They are not weak. There is nothing wrong with them. They are just in the midst of an opportunity to become stronger. To become a better person. To become the person God made them to be. So the next time you are faced with a challenge, look at that challenge as a chance to improve, a chance to learn something new, a chance to advance to the next level! You see God has a plan for all of us, and until we meet our destiny, we need to rely on Him. He puts people in our path for a reason. That reason might be for them to help us, or us to help them. It works both ways – just know, it’s all for a reason! And if we stray the wrong way, God will point us yet again in the right direction because ultimately, He wants the best for us and only the best! Talking to God and thanking him for everything every single day is what gets me through those challenges and obstables and I am so grateful for the learning season. That’s all it is, is a season. There is a reason and a season for everything. Some of us will pass the test and some will take longer. It’s up to us, our attitude, our ability to step out of comfort zone and be vulnerable, our willingness to offer value to a stranger, and our ability to trust in God! What’s your story? What’s your struggle? Whatever it is – you are not alone! God is always with you. He is that voice in your head you hear whispering for you to do something – all you need to do is listen and follow his lead! I will be sharing my story this week and I would like to invite you as I step out of my comfort zone! Have you ever wondered or tried to imagine what someone’s story is? Some people have their story so well buried that you would never be able to guess! National Give Something Away Day! 6. Would be interested in Hosting a Class and receiving a hostess gift or a nice Thank You Check from Young Living! 8. Just not interested at this time. I’ll draw a winner next Saturday morning, and the oil and book will be mailed out as soon as I get your contact info. Good luck, and I can’t wait to hear your answers! My Story – Could Be Your Story – Stress – Avoid It! Stress is something that everyone has to deal with in their lives. Some have more to deal with than others, but everyone has a story to tell. You can look at a person, you may even know the person, but you might never know the stress they are dealing with; the stress they had to deal with it; or the story they are keeping buried deep down inside for fear of judgement. I have a story to share, that will leave you wanting to hear so much more. It’s a story of stress, horrific suffering, survival, self-discovery, and learning to live a better life! This presentation will be done via a ZOOM Video Call. If you do not have Zoom already installed, I suggest you join about ten minutes early just to make sure you are connected and ready to go. I will begin promptly at 7pm EST! AND/OR CLICK TO JOIN EVENT AND GET A REMINDER! I look forward to sharing my story of what stress can do you to you and the 5 things I wish I knew before …..